With BMW 2002 prices on the way up, savvy car nuts should be looking at the same viable alternatives car nuts looked at back when they were new. So if 2002s (and Alfa GTVs) have moved out of your reach, or at least if a good one has, it pays to look back at the Datsun 510. With a good independent suspension and a respectably powerful 1.6 liter four, you can hardly go wrong, and you get some of that Japanese reliability to boot. 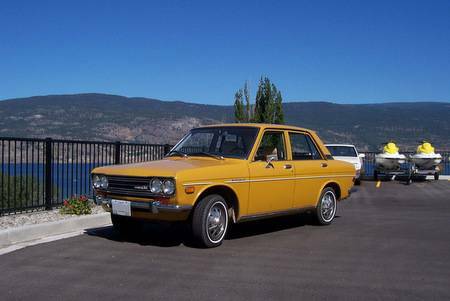 Check out this 1971 Datsun 510 for sale for $2200 near Concord, CA. There’s only one picture, but the short description is like catnip to any lover of old cars – an affordable older car, needing some minor repairs, owned by a recently passed aunt. Four doors are great for taking your friends along, and the manual transmission will help you extract the most out of the engine. With 167K it’s more than broken-in, but these are fairly durable cars, and this one looks well cared-for. If you’re in the eastern San Francisco Bay Area this weekend, it’s worth a look. This entry was posted on September 5, 2014 at 4:42 pm and is filed under Feature. You can follow any responses to this entry through the RSS 2.0 feed. You can leave a response, or trackback from your own site. …and it’s apparently gone already! You should have ran over to Concord and bought this Chris.